Two new species of Epigonus are described from the South Pacific. Epigonus chilensis is described on the basis of five specimens (166.3–208.3 mm standard length) collected from off Chile. It closely resembles Epigonus lenimen (Whitley 1935), but differs in the presence of a minute tubercle on symphysis of lower jaw, body depth, orbital diameter, and lower-jaw length. Epigonus machaera is described on the basis of eight specimens (157.2–174.3 mm standard length) collected from the Chatham Rise, east of New Zealand. It closely resembles Epigonus robustus (Barnard 1927), but differs in the shapes of tongue and two nub-like structures on symphysis of lower jaw and second dorsal-fin spine length. Besides the two new species, 14 species of the genus are characterized by having a pungent opercular spine, more than 40 pored lateral-line scales to end of hypural, and dorsal-fin rays VII-I, 8–10. These species belong to the Epigonus constanciae group, defined in this study. A key to the species in the group is provided. 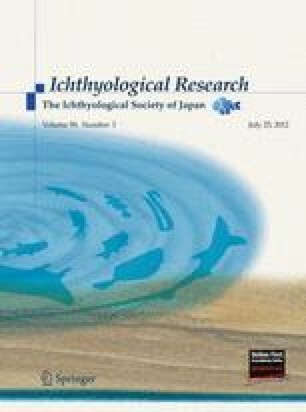 I am most grateful to the following persons and institutions for specimen loans: M. McGrouther, A. Hay, and S. Reader (AMS); Y. Kai (FAKU); I. Aoki (FUMT); M. Yabe and T. Kawai (HUMZ); A. Fukui (IORD); J.A. Seigel (LACM); T. Sato and S. Tomiyama (MSM); K. Matsuura, G. Shinohara, and M. Nakae (NSMT); F. Krupp (SMF); L.M. Page, R.H. Robins, and R.A. Singer (UF); and J. Williams and E. Wilbur (USNM). I also thank M.V. Nazarkin (ZIN) for providing data on the type specimens, H. Motomura (Kagoshima University Museum) for his assistance, and T. Fraser (UF) for his critical reading of the manuscript.